So, today is the big day and yes, I am looking forward to seeing the movie. 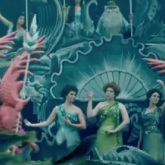 What I'm really interested in, however, is that in the ramp up to this movie I've seen more than the average amount of "delving into Sleeping Beauty's - the literary fairy tale - history", and from a much wider variety of sources as well, than for any other fairy tale movie remade, retold or sent to the "dark side". People are being sent back to their libraries, searching google for this "Perrault" guy, buying up vintage fairy tale volumes with Sleeping Beauty (the extended version) and learning about it would really be like to have an ogre-ish mother-in-law. 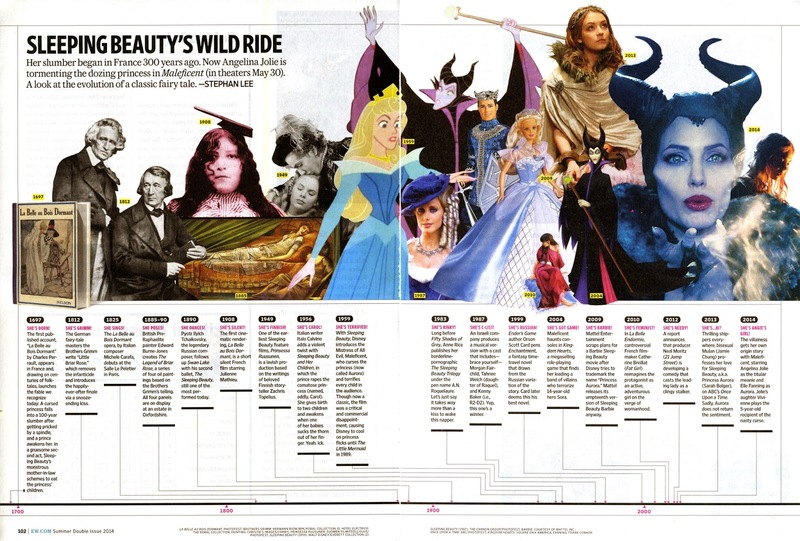 Case in point, seen in Entertainment Weekly this week, a timeline spanning Perrault's tale and it's retellings and remakes till today (literary, the movie being released today, Maleficent). Please click on the image to see the double page scan full size. 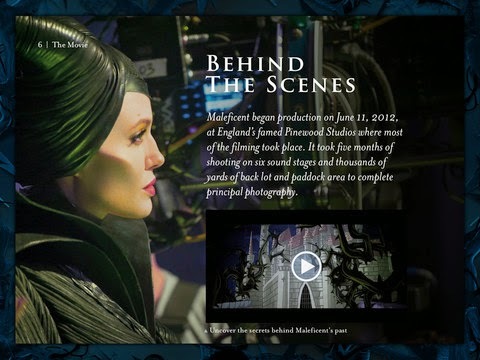 Disney has announced the release of “Maleficent”: The Official Multi-Touch Book. The book,which you can get for free exclusively through iBooks. 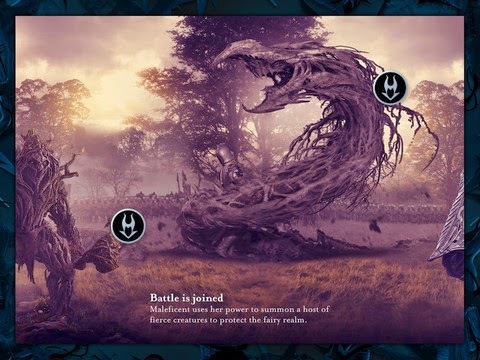 The books include a interactive timeline of the origins of the timeless “Sleeping Beauty” tale, with rare content from the Disney archives; rich and explorable environments, filled with fantastic creatures from the world of “Maleficent”—waiting to be discovered at your fingertips; interviews with Angelina Jolie and the cast and crew responsible for bringing the reimagined story to the big screen; an afterword by director Robert Stromberg, two-time Academy Award, winner for production design on “Alice in Wonderland” and “Avatar”; exclusive behind-the-scenes photo galleries and video featurettes; never-before-seen concept art, storyboards and sketches from pre-production; fun facts from the set; and profiles of the characters from the film, all created by Apple’s digital book creation app, iBooks Author. The “Maleficent” book is available for free, exclusively on iBooks HERE. 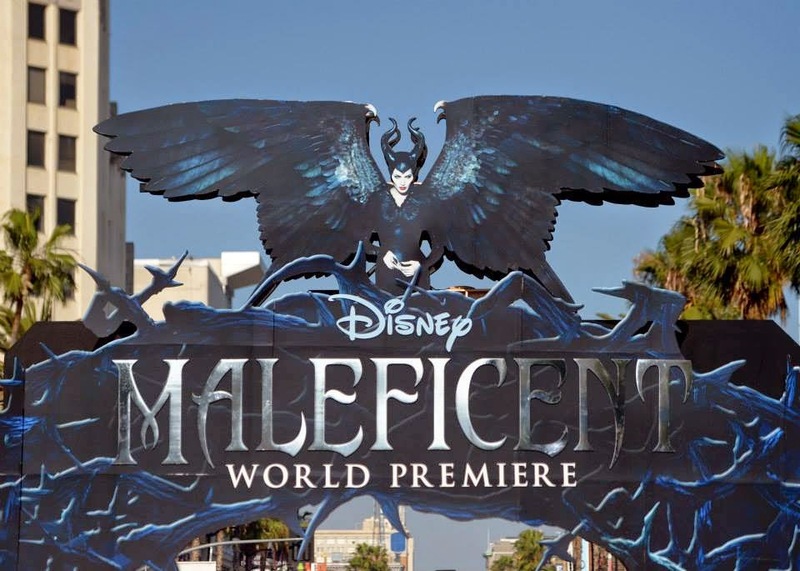 Maleficent is a family movie and not only the fairy tale of Sleeping Beauty, but also the idea of a more traditional (to fairy tales) "faerie world" are a big factor in this one, as are some other mythic elements. 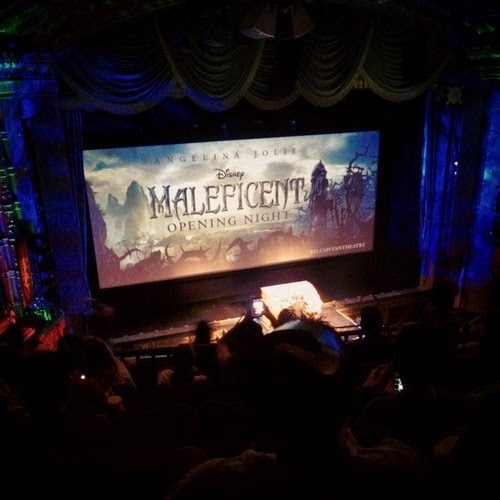 I'm really curious to see, not only if it's a good movie, but what impact it will have on fairy tale movies in the future, on people's perception of fairy tales and faerie and if it will mark yet another significant change in the approach Disney has been having to fairy tale properties. 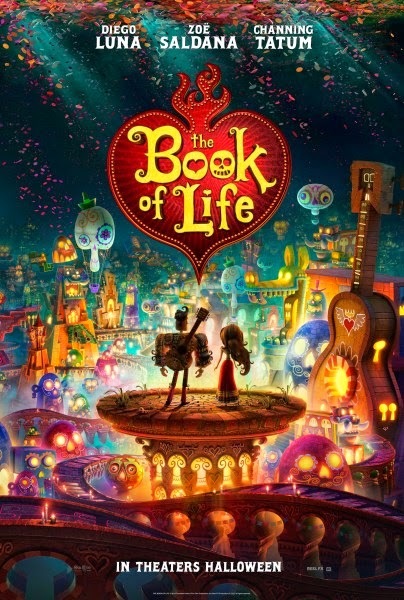 The Book of Life: Produced by Guillermo Del Toro and directed by Jorge Gutierrez, the film revolves around three childhood friends—Manolo (Diego Luna), Maria (Zoe Saldana), and Joaquin (Channing Tatum)—who find themselves in a love triangle as the gods wager on who will win Maria’s heart. Manolo is the central character of the story, as he dreams of breaking his family tradition of bullfighting to become a guitar player. Over the course of the fantastical story, audiences are taken to The Land of the Living, the Land of the Remembered, and the Land of the Forgotten as Manolo seeks to live a complete and fulfilling life that is remembered by the living. You can see more on the upcoming film HERE (stills and more). 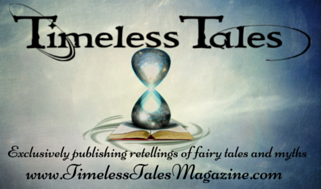 Sounds like a good time to pull out Heidi's wonderful collection on Sleeping Beauties again (SurLaLune Fairy Tale Series book). I hope it's good. Not an Angelina fan, but I'd love to see this work. I plan on seeing it tomorrow and hopefully having a review up by evening. Maleficent - the old mistress of the animals (and the woods) - should not be violated and mutilated, since only she is capable of loving all creatures with UNCONDITIONED LOVE, including loving humans (domesticated-civilized „little beasties“). Song of the Sea Gets It's First Real Trailer! Trailer: "The Book Of Life"
Lisa Stock's "The Buried Moon"